Franklin D. Cossitt’s vision of building a quality community began when he bought and developed a large tract of land that was incorporated as the Village of La Grange in 1879. A native of Granby, Connecticut, Mr. Cossitt moved to Chicago from La Grange, Tennessee, when his cotton farm was ravaged during the Civil War. In 1862 he built a wholesale grocery business which became the largest one in Chicago. 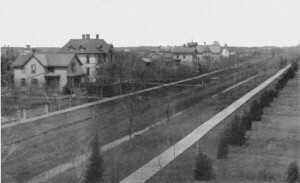 When it was destroyed by the Chicago Fire, he immediately set to work rebuilding the business and developing the 600 acres that he had purchased adjacent to the railroad that included the area bounded by Ogden Avenue on the north, 47th street on the south, Bluff Avenue on the east and Waiola Avenue on the west. The Great Chicago Fire of 1871 spurred movement of people westward to the suburbs. Improvements to the Village began in earnest in 1873 when Franklin Cossitt planted trees, donated property to churches and schools. He laid-out streets and built fine-quality homes, ranging in value from $2,000 to $8,000. 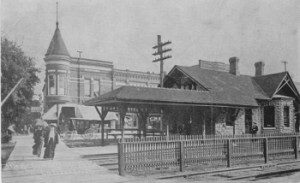 Mr. Cossitt built a new railroad depot at Fifth Avenue (La Grange Road) station. His son-in-law, David Lyman, donated funds to build the early railroad depot at Stone Avenue. By 1890 there were 28 retail businesses in the Village, the construction crews had finished the new high school and the following year Lyons Township High School held its first graduation. Along with the railroad, paved streets, telephone, a newspaper, new schools and churches, word of the growth of La Grange spread, and soon thereafter the Village was described as the largest of towns on the road between Chicago and Aurora. For those who originally settled in La Grange and those who live here today, the character of the Village has been shaped by the peoples’ dedication to their homes, schools and churches. No person had more impact than Franklin D. Cossitt, the Village founder and its first president. For more information about the history of La Grange, consult the La Grange Centennial History, published by the La Grange Area Historical Society, 1979, or contact the Society.